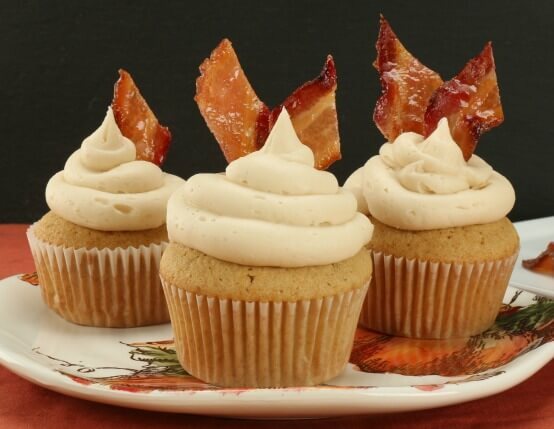 Candied bacon and maple pair perfectly in these adult cupcakes. Spiked with bourbon and topped with maple buttercream, they’ll be a hit at your next party. Sift together flour, baking soda and salt; set aside. Cream butter and sugar together in large bowl; add eggs one at a time, blend well. Stir in bourbon. Alternate flour mixture and milk, stirring until well mixed. Fill paper baking cups 2/3 to 3/4 full. Bake for 22-25 minutes, remove from oven, and allow to cool. Arrange bacon on sheet pan lined with parchment paper. Drizzle each strip with 1 teaspoon honey, then using a pastry brush or finger, spread honey so each strip is evenly coated. Sprinkle 1 tablespoon of brown sugar on each strip of bacon. Bake in 350˚F oven about 20 minutes. The brown sugar should be completely melted and bacon thoroughly cooked. 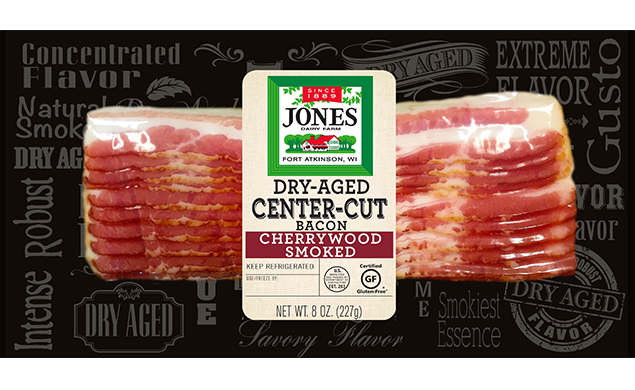 When bacon is cool cut strips at angle into 1 1/4-inch strips. In medium bowl, cream butter with electric mixer until light and fluffy. Add powdered sugar 1/3 at a time, scraping bowl frequently. Add maple syrup and maple extract. When cupcakes are cool, frost and garnish with candied bacon. Wow these are good cupcakes! I was looking for recipes online that included the following: bourbon, real maple syrup, bacon, and most importantly made from scratch. My only critique is that the recipe as is yielded 5 oversized cupcakes. I used Parchemin lotus cupcake cups because I wanted a masculine presentation. Making these for work for International Men's Day. My tweak to recipe: added three strips of crumbled bacon to cupcake mix while mix with flour, etc. After my first taste test, I think I could have added 6 crumbled strips. The crumbles in the cupcake are just delicious when it combines in your mouth with the frosting. My only twea​k to the frosting: I added 1.5 tsp of pure vanilla extract. ​Now I'm making a batch doubling the cupcake mix. Thank you! I expect my coworkers will love it. One other possible tweak is to use a little less bourbon, but can't say yet what to decrease to. Not sure if it will taste differently though tomorrow or if the bourbon was a little overpowering because I just ate it after cooling it down a bit. Overall recipe is a keeper! Bourbon and bacon should be tweaked to personal tastes.